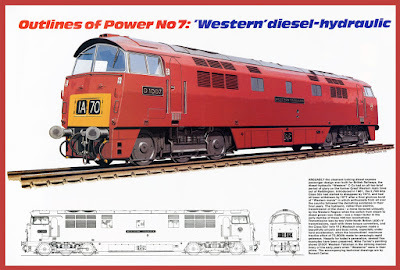 I think it is high time for the seventh 'Outlines of Power' article by Mike Turner, that the magazine 'Rail Enthusiast' ran during the early 1980s. This time we have the Class 52 'Western' diesel hydraulic with a wonderful portrait of D1007 'Western Talisman' resplendent in maroon livery with small yellow warning panels. Arguably the cleanest-looking diesel express passenger design ever built for British Railways, the diesel-hydraulic "Western" C-Cs had an all-too-brief period of glory on the former Great Western main lines out of Paddington. 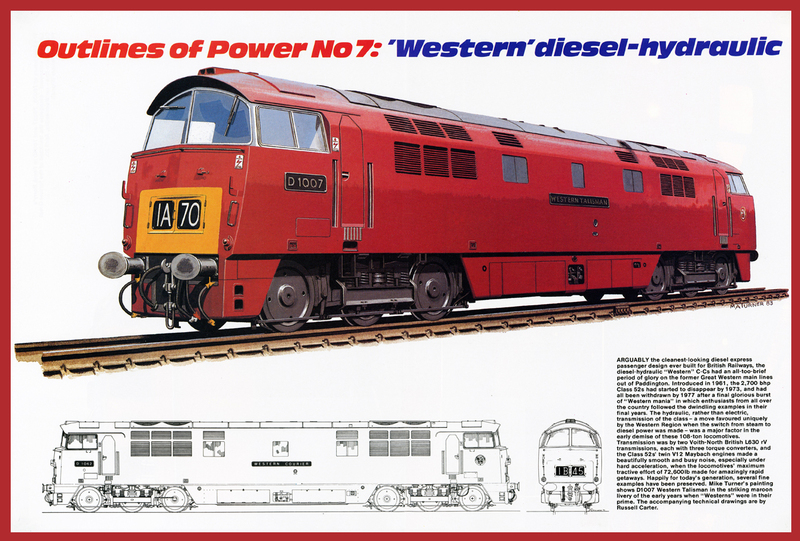 Introduced in 1961, the 2,700 bhp Class 52s had started to disappear by 1973, and had all been withdrawn by 1977 after a final glorious burst of "Western Mania" in which enthusiasts from all over the country followed the dwindling examples in their final years. The hydraulic, rather than electric transmission of the class - a move favoured uniquely by the Western Region when the switch from steam to diesel power was made, was a major factor in the early demise of these 108-ton locomotives. Transmission was by two Voith-North British L630 rV transmissions, each with three torque converters, and the Class 52's twin Maybach engines made a beautifully smooth and busy noise, especially under hard acceleration, when the locomotives' maximum tractive effort of 72,600lb made for amazingly rapid getaways. Happily for today's generation, several fine examples have been preserved. Mike Turner's painting shows D1007 'Western Talisman' in the striking maroon livery of the early years when "Westerns" were in their prime. The accompanying technical drawings are by Russell Carter.